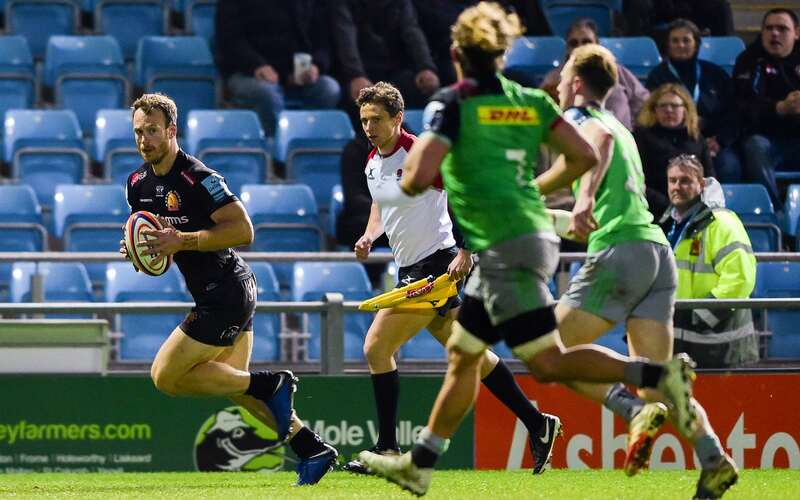 Exeter Braves are within touching distance of securing themselves a place in the semi-finals of this season’s Premiership Rugby Shield, after they swept aside visiting Harlequins at Sandy Park. 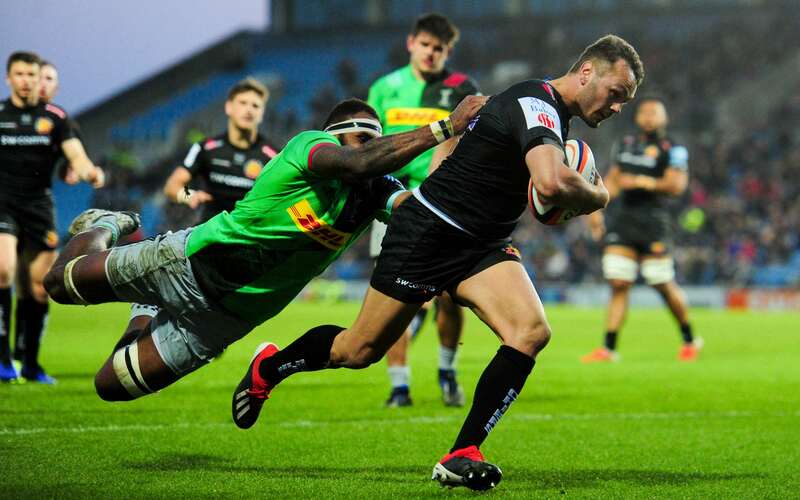 Last season’s beaten finalists were in sparkling form against the Londoners, running in seven tries on the night to extend their lead over Saracens Storm at the top of the Southern Conference. Ricky Pellow’s side dominated from start to finish, notching up their seventh win of the campaign courtesy of tries from James Freeman, Phil Dollman (2), Tom O’Flaherty, Harry Strong, James Short and Harvey Skinner, who also pocketed six conversions on on the night. Harlequins played their part in an entertaining encounter, but their sole rewards were courtesy of first half tries from Hugh Tizard and Zachary Clow, one of which was converted by Sam Stanley. Back in action for the first time since January when they beat Gloucester, it was a powerful Braves outfit that took to the field for this latest assignment.Try-scorer Freeman headed up the home ranks, playing his first game in months following injury, and he was joined in the home pack by experienced stars such as Elvis Taione, Greg Holmes and Aussie locks Ollie Atkins and Mitch Lees. Behind them, Skinner was the pivot for an exciting back division which - as it proved - offered a razor-sharp edge to the home attack. Just two minutes had elapsed when the Braves fashioned their first opening of the night.Winger O’Flaherty and Freeman were at the heart of matters, but they spurned that first opening, knocking on close to the line.It was, however, a brief let-off as within minutes Freeman was breaking the deadlock, the all-action forward finishing off some heavyweight approach work from the home pack. Skinner converted that score and Exeter’s second which arrived on nine minutes.Dollman was the beneficiary on this occasion, finishing off a pass from the lively Bodilly, who had been given time and space following neat approach work from Skinner and Tom Hendrickson. Already two converted scores adrift, the visitors needed to summon a response of sorts.Thankfully for them, they did just that, reducing the deficit when Tizard was credited with the try after Harlequins had worked the opening off a well-drilled, five0-metre line-out. Up and running, Harlequins would have been pleased with the score, but the home response was almost immediate.Replacement Toby Salmon was held up on the line after Short had also gone close, before Dollman then glided over for his second of the game, the Welsh full-back applying the finish after the Braves had exploited the short-side from a close-range scrum. Exeter could - and probably should - have added to their tally as the half continued, but it was their opponents who claimed the only other converted score of the half, winger Clow applying the finish from deep inside the Braves 22. The second half was only three minutes old when the Braves got back on the scoresheet, O’Flaherty - a livewire throughout the match - powering over in the left-hand corner after he had cleverly snuck in off the other flank to exploit the numbers game out wide. Bonus point secured and with a healthy advantage, it was time for the Braves to now start to flex their muscles.The pack were dominant throughout, particularly at scrum time, while behind the ever-willing Bodilly and Hendrickson were causing no end of problems with their midfield running. It was, however, the home side’s two playmakers - Sam Maunder and Skinner - who combined to claim Exeter’s fifth try, just before the hour mark.Having collected possession centre field, Maunder burst through the heart of the Harlequins defence, only to be felled just shy of the try-line. The cavalry, though, was close to hand and in the blink of an eye, the Braves recycled the ball quickly to the right where the waiting Skinner was able to pick his spot and dive over for the score, which he was also able to convert with ease. Pellow took the opportunity to run his bench during the final quarter and it was one of the replacements, Strong, who turned on the after burners for their sixth try, the winger scorching clear of the cover to finish off sublime build-up play involving Skinner and Hendrickson. To their credit, Harlequins continued to offer a decent resistance during the second period, but with their attack lacking any real potency, the Braves were happy to soak up the pressure and clear the danger as and when it was needed. In the end, it was the Braves who put the finishing touches on their polished performance, Short dotting down with the last play of the game to seal the win and put his side in pole position of their group with just two qualifying games remaining. The Braves travel to Bristol Bears this Sunday (1pm), knowing a similar victory up there will ensure them of the last four and, most likely, home advantage in the semi-finals. Exeter Braves: P Dollman (S Morley); J Short, M Bodilly, T Hendrickson, T O’Flaherty (H Strong 56); H Skinner, S Maunder (J Snow 66); B Keast (M Low 49), E Taione (J Innard 49), G Holmes (M Street 49); M Lees (T Salmon 18), O Atkins, J Freeman (capt, O Kaufusi 17), S Lonsdale, T Lawday. Harlequins: J Burden; H Barlow, W Morris (J Bourton 74), H Cheeseman (J Bourton 49-56), Z Clow; S Stanley, N Saunders (S Bullock 70); M Lambert (J Musk 66), R Buchanan (G Head 50, M Lambert 79), J McNulty (K Sassone 73); S South, H Tizard (B Eduardo 74); S Kunatani, L Wallace, A White (capt, J Kenningham 62).